Overnight wedding accommodations on the estate are available for up to twenty-five people. On our surrounding properties we are able to accommodate another 80+. At Riverside Farm in Vermont your guests may stay in the unique accommodations, which include the River Studio, the Caretakers Cottage, and the recently renovated Stables, as well as the stunning Bridal Suite and new Groom's Cabin. Riverside Farm can provide you and your guests with a weekend they will never forget. Please consult with our onsite-coordinator for rates and more information. 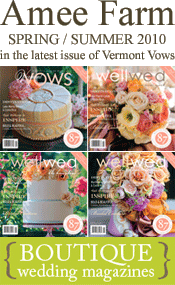 We invite you to Vermont, and to Riverside Farm, for a vacation or wedding you and your family will always remember.